The life and achievements of Ira Aldridge were celebrated on the 150th anniversary of his death. 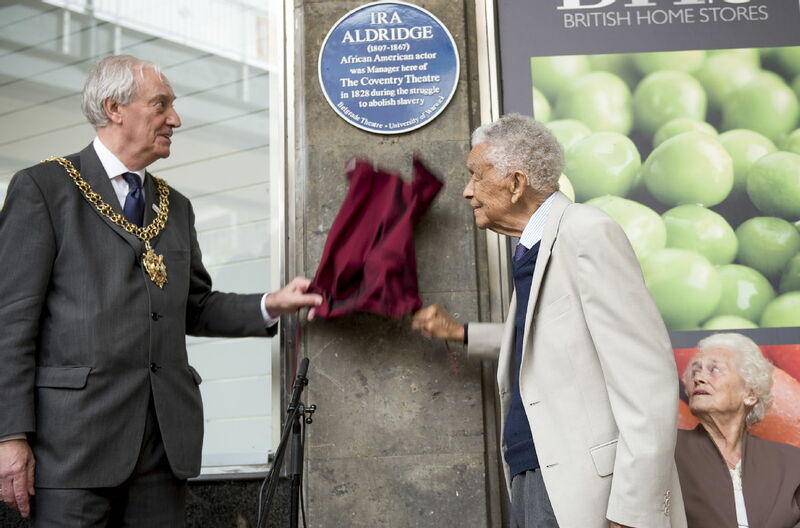 In 1828, at the height of the fight against slavery, Aldridge made history by becoming Manager of the Coventry Theatre for a seaon -- the first black artist ever to run a British theatre. 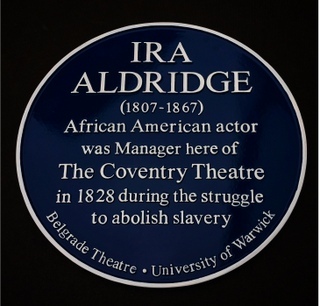 The University of Warwick and the Belgrade Theatre arranged for a plaque to be installed on the site of the original Coventry Theatre, to commemorate Ira Aldridge's unique contribution to the life of the city. 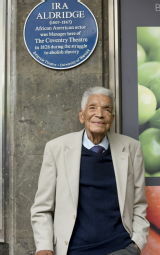 Coventry's Lord Mayor unveiled this plaque with the guest of honour Earl Cameron CBE, who will shortly celebrat his 100th birthday. Earl was taught by Ira Aldridge's daughter Amanda. Others taking part were the actors Nichols Bailey and Ray Fearon, Warwick's Provost Christine Ennew, and musicians from the Positive Youth Foundation. We're proud to be able to thank them all here. :The project to honour Ira Aldridge grew out of the AHRC-funded Multicultural Shakespeare project, and its development has been supported by Being Human: A Festival of the Humanities, and the Coventry City of Culture Campaign.